The new summer Vogues have been released. Part of me wants to find many gorgeous new patterns, another part almost hopes that there is nothing exciting to tempt me and/or distract me from the fifty other projects I have lined up in my head. But it would seem that they are continuing to release more interesting/complicated designs . . . and you know what that means. There are two new vintage reproductions. Vogue 9105 has a lovely diagonal front opening that closes with buttons. This is certainly not my favorite version of the asymmetrical button opening, but I can live with it. 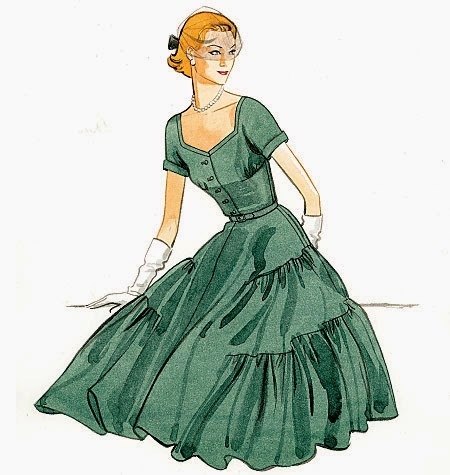 It reminds me of Vintage Vogue 1043 (now out of print) which I love and keep meaning to make myself a second version. This new offering features “skirt stiffening” in the form of muslin. I am curious to see what exactly is going on with that! 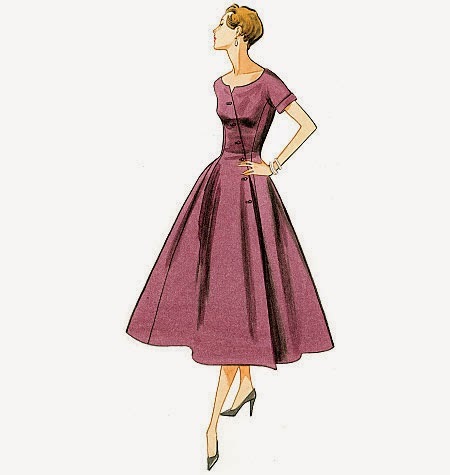 I have never heard of muslin being used as a “stiffening” material, although I have seen first-hand examples of Pellon being used as an underlining in vintage dresses. I am also intrigued to see if the left front hooks into a side seam, and if the entire buttoned edge opens. All that I know is the lack of a waist seam means this one hogs fabric like crazy (6 yards are required for 45” wide fabric – yikes!). But I definitely want to peek inside this particular pattern envelope. I am really excited about Vogue 9106. The skirt tiers are unlike any pattern I have in my stash, and I think this one is a winner! Thank you, Lisa of "As I Said", for sending your pattern to Vogue! This beauty is described as a "pullover dress" - say what?! But wait, it has a side zipper . . . that makes more sense. And isn't every dress a "pullover"? Maybe they are clarifying that you cannot "step into" this one because it only unbuttons to the waist? "Curiouser and curiouser!" My only complaint is that both of these reproductions have a very similar feel and copyright date, which seems to be a trend in the Vintage Vogue line, now that I think about it. How about a little variation, and not two full-skirted, short-sleeved dresses in the same catalog? And why did they start cramming the vintage reproductions in the smaller sized envelopes a few years ago? I miss all of the extra space! I also find myself strangely drawn to Vogue 1451 – or maybe not so strange considering my love of so many of Donna Karan’s designs. I am very tempted to make this up and test my theory that everything I put on ends up looking old-fashioned! I can't see it happening wearing a design like this, but who knows?! Vogue 1447, a Tracy Reese design, also has some wonderful seaming that I might be inclined to try. This one I am quite sure I would make look vintage. The line drawing has a bit of a 1930s feel to me. And it may have something to do with the fabulous graphic print, but I love this Easy Options design. The back seaming is gorgeous. I have been so good lately about working with stashed items, but I feel a pattern binge coming on . . .
Will any of the new Vogue offerings tempt you? Does it seem to you that there are fewer patterns in each release than there used to be? Anyway - I like the Donna Karan ones and I immediately decided on V1448 which looks both wearable and ultra-girly. I like that that jersey is one of the fabric choices so it could be a more casual summer dress in that fabric. Looking forward to seeing what you sew up. I would make the V9103 in view A. All the others - meh. Because I mainly draft my own patterns, I never buy modern ones but I like your posts about them. I love 9105. Those buttons! But I've got a lot of other things to sew at the moment and the price of vogues in the uk is definitely off putting! There are many that I love. I'm more of a separates sewer but I will be picking up ateast a half dozen! I've already got the next Vogue sale at Hancock on the calendar! I'm lucky that "my" store has them in stock immediately, nearly every time. I always like seeing your rundown of the new patterns. Unfortunately, the Vintage Vogues with the big skirts don't work on me at this age. The Easy Options pattern is similar to a 70s Halston pattern in my stash, and looks universally flattering. I was just looking at these new patterns and couldn't wait to see what you thought of the vintage reproductions. I really like that asymmetrical button-front one but don't see myself actually wearing it. I enjoy living vicariously through your style. I have fallen for V 9106 too. It has a girly barn dance feel to it, but somehow it's very very wearable. 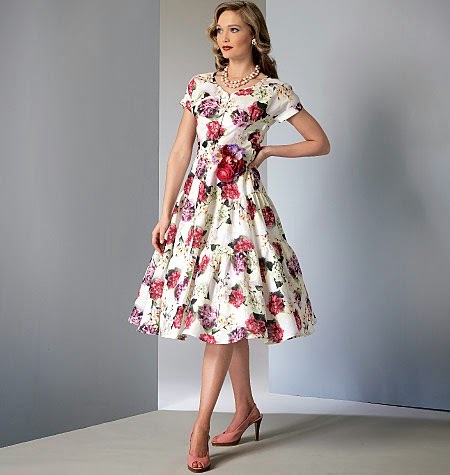 The neckline is great, that skirt is so different and those little gathers in the bodice. I love it all. I can see me swapping out the bodice for a gypsy style one too. Full marks Vogue. V 9013 is great, I generally love anything with an empire line and flowing skirt and especially that little collar, but would work a bit better in a drape fabric to make that skirt less A line. Thank you for taking the time to pull together this group of new Vogue patterns. I like that 9106 will have an all-over texture from those ruffles, yet keep a slim and smooth center front. To me that dress resembles those crinkle cotton southwest style patio dresses from the 50's that were trimmed in rick-rack or braid, which could be a cute look for summer. I have to admit that every time one of the big 4 releases a "vintage" pattern, my first thought is what you will think of it. I rarely (read 'never' except for wedding of my children) wear a dress, but I enjoy seeing the outcome of your stellar work. When I saw Vogue 1410, I thought it had your name all over it--I guess I was wrong. I was quite pleased with this release and also feel a binge order coming up. That little girls' dress pattern is too adorable. And the Marcy Tilton dress, top and legging pattern made it onto my list of wants.